The property was built by prominent Oakland pioneer Enoch Pardee, who was a state senator and representative to the Assembly. 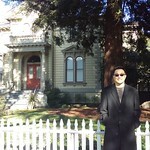 He was also mayor of Oakland in the 1870’s. Enoch Pardee’s son George also served as Oakland’s mayor but is better known as the “Earthquake” Governor of California, holding office from 1903 through 1907. George Pardee was an important Progressive voice in California Republican politics, but his efforts at reform during his governorship brought on the wrath of the railroads and lost him the nomination of his party for a second term. Pardee went on to work for conservationist causes and to help bring Mokelumne River water to Oakland. The Pardee Dam on that river is named after him.